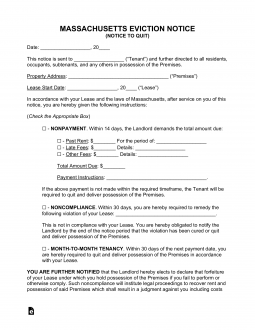 The Massachusetts eviction notice forms are used by a landlord to let a tenant know that the lease is terminating and that they have to move out. It is very important that the landlord provide requisite notice before commencing an action in court to have the tenant evicted. Once the notice period has ended, a landlord will have to choose the court in which to file the Summary Process Action. A landlord can file a Summons and Complaint (See Sample) in either the Local Housing Court or the Boston Municipal Court or the District Court that covers the city or town where the property is located. The landlord must obtain the Summons and Complaint from the court for a small fee. After filling out the form, but before it is filed, it must be served on the tenant by a sheriff or constable. The Sheriff or Constable will then provide a return of service, which must be filed with the Summons and Complaint and a copy of the notice provided to tenant. 14-Day Notice to Quit (Non-Payment) – This form of notice is used when a tenant has not paid rent when it is due. Landlord must make sure it is received by the tenant. 30-Day Notice to Quit (Month to Month) – This form is used for any other legal reason to end a tenancy including informing the tenant of the end of a month-to-month tenancy. 30-Day Notice Non-Compliance – There is no State statute in regard to notice provided to a tenant for violating a portion of the lease; however, the Housing Court accepts 30-day notice violations in the event of a lease violation by the tenant. Rent is due in Massachusetts on the due date set forth in the lease. Once the tenant receives notice from landlord, he or she will have fourteen (14) days to cure before the landlord can begin eviction proceedings. Step 2 – Once the requisite notice period has passed without a response from tenant, landlord may begin proceedings by going to the local court in the area of the leased premises, either Housing Court, Boston Municipal Court or District Court to obtain a Summons and Complaint (View Sample). The landlord must use the form provided by the court and must pay the respective Filing Fee when submitting. Step 3 – The landlord fills out the forms and then serves them upon the tenant in accordance with Rule 4(d). The landlord will then make a copy of the service that was served on the tenant and file that with the court. The tenant will have the right to speak their side of the story through the Summary Process Answer Form (View Tips on How to Represent Yourself as the Tenant) no later than the first (1st) Monday after the entry day. Step 4 – Before the hearing date, any of the parties may file a Discovery before the first (1st) Monday after the entry day in order to view any and all documents that may be presented against them on the court date. Step 5 – If tenant doesn’t answer and/or landlord receives a judgment in his or her favor, the landlord may obtain an execution eleven days after the judgment which he would bring to the sheriff or constable the next day. Sheriff serves the execution on tenant which gives them 48 hours to move out before the sheriff come in to evict. The Massachusetts Notice To Quit is accessible as a PDF, ODT, or Word file on this page (through the buttons labeled “PDF,” “ODT,” and “Word,” respectively). Most would consider it wise to review the Landlord/Tenant Agreement beforehand as some Lease information will be transcribed. The intended Recipient of this Notice is the individual who this document is focused on informing. Report the Name of this individual in the first blank space at the top of the page. The Lessor and Lessee will both have made an agreement regarding the property listed on the Lease. This Notice will concern itself with such an agreement. Report the City, County, Zip Code, and Apartment Number of the Leased Property across the blank spaces of the first sentence. The Signature Date on the Lease will need to be supplied across the blank spaces in the second statement of this document. Make sure this is reported precisely. If this Notice is addressed to a Tenant who has not paid their Rent, then check the “Nonpayment” check box. This statement gives the Addressee on this Notice fourteen days to pay the rent to the individual you name on the first blank space or the undersigned or quit the Rental Property. This statement will also need a specific definition to the amounts owed as well as the amount that must be paid for the time period that must be paid for to be reported. If this Notice is addressed to a Tenant who has violated the terms of the Rental Agreement, then check the “Noncompliance” check box and describe the Violation on the blank line in this statement. The Tenant will have Thirty Days to Comply or Vacate. If this Notice is addressed to a Tenant from a Landlord ending a Month to Month Rental Agreement, then check the first “Month to Month Tenancy” check box. The Date this Month to Month Rental Agreement ceases must be reported and must be at least Thirty Days from receipt of this document. If this Notice is addressed from a Tenant ending a Month to Month Rental Agreement, then check the second “Month to Month Tenancy” check box. The Date when this Agreement is expected to end must be reported on the blank spaces in this statement. Make sure this will allow at least Thirty Days to pass between the Receipt Date of this Notice and the End Date. The Owner or Landlord must sign his or her Name on the blank line below the paragraph demanding compliance. The “Certificate of Delivery” section must be filled out by the Agent of Delivery at the time Delivery is effected. Here, the Agent of Delivery must report the Date the Notice has been delivered on the first blank line. Then on the second space, the Agent will report who the Notice was delivered to. There will be a series of three sentences below this initial statement, each with a check box. The Agent of Delivery will use this area to indicate if this Notice was deliver to the Addressee noted at the top of the page, to a household member or other reliable of age party who will complete the delivery, or if it had to be Mailed First Class to the Addressee. When, this section has been completed accurately, the Agent must Sign his or her Name to validate this section.